A new line of heavy-duty 13 oz. 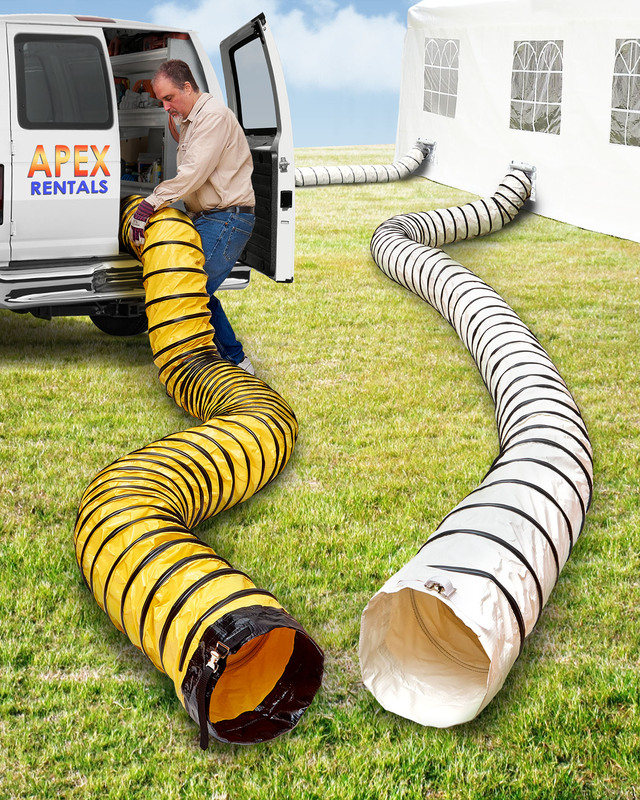 stitched hose that is engineered for high performance in air conditioning, dehumidification, and mild heating rental applications is being introduced by FLEXAUST of Warsaw, Indiana. FLEXAUST® FX-180 is a heavy-duty 13 oz. PVC scrim with a rip stop technology and lock stitch construction, a durable PVC wear strip to provide 360 degree external protection, and a high tensile spring steel wire per M-3001 for crush resistance. This A/C, heat, and dehumidification hose is ideal for rental applications requiring repeated pulling, dragging, and compressing. Providing excellent tensile strength, FLEXAUST® FX-180 resists UV, rot, and meets UL94V for flame resistance. Available in standard yellow, white, and black colors with belted cuffs, 12” to 24” dia. sizes and 25 ft. lengths, custom sizes and lengths to 50 ft. are offered. Custom colors for OEMs and a variety of connection accessories are also available. FLEXAUST® FX-180 Stitched Duct is priced according to size and quantity. Samples and price quotations are available upon request.